It’s Quilting Day today, so I’m celebrating by inviting you to follow/friend/join me on Facebook! My regular account where you can friend me: search for christaquilts (or by my full name Christa Watson). My business page: ChristaQuiltscom – I’m not really sure what the advantage is for having a page, but I’ll learn pretty quickly, I’m sure. For now, it just automatically lists my daily blog posts as they go live. My public group: Quilt With Christa – this is the one I’m most excited about. Ever since I started my quilt alongs, I wanted an easy place for followers to posts pictures and share their progress. I tried flickr for awhile, but that got to be too cumbersome. Welcome to Facebook land! I don’t actually have a quilty facebook page yet, but I accepted your friend request to my personal account. My blog posts go up on my personal page, but most of my quilty posts are in a group I started with Stephanie & Michelle (Late Night Quilter) less than a year ago, called Late Night Quilters Club. It’s a fabulous group of positive, supportive, inspiration and tip-sharing quilters. It’s a private group (so that posts in the group are not visible to non-members, and so that we can be sure to filter out the spammers), but if you request to join, I’ll approve you stat! 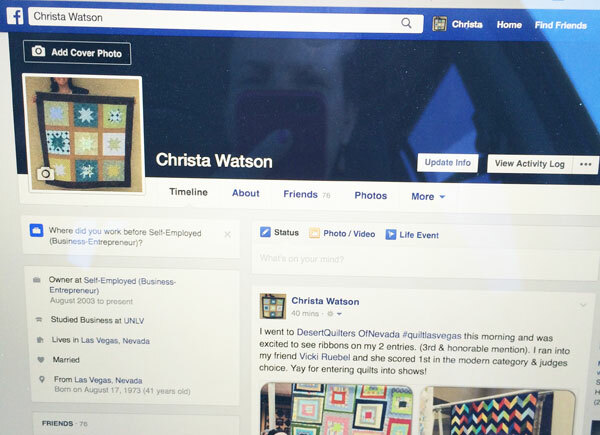 I’m looking forward to your next Facebook quiltalong, and in the meantime, have fun learning the ropes! I honestly use my blog and IG much more for quilt related stuff, but it will be fun to see what you’re got going on Facebook. I am following your business page now Christa! I recently started using Instagram…..still learning that one 🙂 Have fun! I use my personal page to stay in touch with friends and family (and some close quilty friends!) and my blog page mostly just for post updates. Find myself using IG a lot more for blog stuff. 🙂 Anyway, I friended you! I hope you’ll continue to blog online because I don’t have Facebook. I enjoy reading about your growing as a quilter and love your modern quilt visions and would be so disappointed if they were only available on Facebook.